A little confused when it comes to sorting out stone shapes and cuts? That's understandable. Sometimes people refer to stone shapes as cuts, although that's not quite accurate. Looking at the topic a bit closer there's actually a pretty big difference. You might say that the shape of a stone is what you see when you look down on it: round, pear, marquis or heart along with a number of others. The cut goes beyond the surface, however, and actually defines the brilliance of the stone. And some of cuts sparkle more than others, especially with older diamonds. There are many different cuts you'll run across when shopping for antique fine jewelry, and a number of them fall into the brilliant category such as the old mine cut and the cushion cut. These can vary when it comes to the number of facets but they sparkle far more than rose cut examples as exhibited below. In comparison to older brilliants, modern brilliant cut diamonds, which were developed in the early 20th century, have 58 facets and they are cut so that the sparkle of each individual stone is maximized regardless of the shape. Rose cut diamonds, which can look quite crude and rock-like compared to brilliant cuts, came in single and double cuts. Single rose cuts have a single layer of facets as the name implies. Double rose cuts have two layers of facets. Examples with two or three rows of high facets are referenced as Dutch rose cuts. No rose cut - whether single, double or Dutch - is completely round due to the way they were hand faceted. Finding a round diamond with rose cutting can be indicative of a newer machine cut stone made to resemble an older one. Rose cut stones are found mainly in 18th to mid-19th-century pieces, though rose cutting continued into the late 1800s. 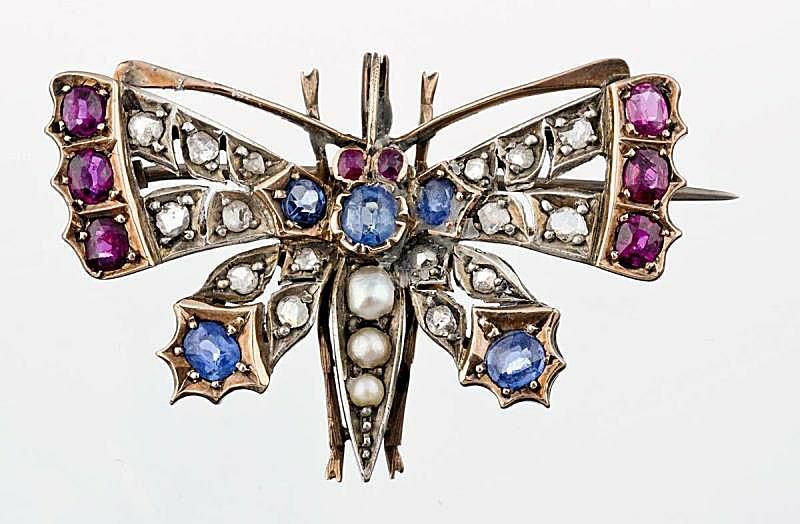 This cut, often associated with Georgian jewelry, was gradually supplanted by more brilliant cuts as jewelry tastes changed moving toward the turn of the 20th century. Later use is often seen in smaller, semi-precious such as garnets, or inferior stones to hide inclusions and poor coloring. Keep in mind, also, that the rose cut is not the earliest diamond cut you will find in antique jewelry. There is also the "point cut" in which the stone resembles a pyramid protruding from the setting but with only four facets. These, sometimes called a "writing" diamond, were used in jewelry for hundreds of years beginning in the 15th century. Another older cut is the "table cut" stone, in which there is a single facet on each of four sides and a flat top. These were used in jewelry in the 1600s moving into the early 1700s, according to GeorgianJewelry.com. Neither of these cuts is commonly found by jewelry collectors today, but getting to know them is beneficial so those rare pieces can be readily spotted. Victorian 18K gold earrings with old mine cut diamonds. This historic style of cutting and faceting a gemstone, one of the first types of brilliant cuts, enhances the reflection of light and amplifies sparkle. It is characterized by 56 facets, a small flat base, and a larger flat table-like surface (when viewed sideways, the entire stone is hexagonal in shape). It is sometimes referenced as a triple cut. This cut was developed around 1730 (though the term dates from the late 1800s), it was used mainly in the second half of the 18th century through the end of the 19th century when it was supplanted by more precise and intricate brilliant cuts. In fact, compared to the fiery flash of contemporary brilliant-cut stones, old mine cut diamonds possess a more subtle sparkle. Old mine cuts can sometimes be confused with modern cushion cut diamonds. Today, some cushion cut diamonds are actually certified as “old mine brilliants," according to diamond experts at Ritani.com. In fact, they describe old mine cut diamonds as basically cushion cuts with different proportions and fewer facets. In spite of the name, this type of stone was not invented or cut in France although they have historically been in demand there. They were developed in the 1400s but really came into their own in the 17th century. While French cut stones flourished in jewelry designed much earlier, they were also popular during Art Deco era of the 1920s and '30s when geometric shapes became all the rage. The square shaped versions (they can be rectangular as well) lent to their use in beautifully constructed line bracelets, in fact. In addition to diamonds, sapphires have often been French cut. This stone cut was created in 1902 by Joseph Asscher, so the oldest versions are true antiques. According to the Royal Asscher website, "The diamond is perfectly symmetrical, with proportions that fall within strict parameters; every facet is measured for absolute accuracy. The Royal Asscher Cut has a high crown and 74 facets – whereas the modern square-emerald cut, and the original Asscher both have 58 facets." So, older Asscher cut diamonds with their larger corners and smaller tables (the flat top area of a stone), in addition to fewer facets, are quite beautiful but do not emphasize clarity and brilliance as well as modern ones produced more recently. Special thanks to contributing writer Troy Segal for her assistance with this feature.